Watch the 44' Zeelander 2013 in the water. She glistens in the sun! : Atlantic Yacht & Ship, Inc.
Watch the 44′ Zeelander 2013 in the water. She glistens in the sun! 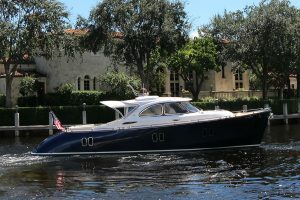 This 44’ Zeelander 2013 has remained behind the owner’s home and has always been captain maintained. Likewise, no expense has been spared in her maintenance or upgrades. Her metallic midnight blue hull glistens in the sun and pops against her diamond white topside. Low profile stainless steel rails are around the entire boat. Composite decks with teak appearance result in low maintenance exterior. Furthermore, the interior is spotless! A custom drawer with interior racks can secure 12 champagne glasses, 12 wine glasses, 12 tumblers, and 4 plates. A perfect setup for a day or evening of entertaining with friends and family. The 44′ Zeelander is extremely quiet with her silent line technology. She is easy to maneuver and her dynamic positioning system (DPS) makes docking a breeze. Additionally, the Twin Volvo Penta engines make her a fast ride with a max speed of 34 knots. While the cruising speed is 30 knots. Contact John Slate at Atlantic Yacht & Ship, Inc. for more information on Zeelander Yachts. CLICK HERE TO WATCH THE 44′ ZEELANDER 2013 IN THE WATER!